It is important to the University to provide a teaching and learning environment that you are comfortable in. If something does go wrong, doesn’t feel right to you, or you’re not happy with a decision, you can raise your concern or make a formal complaint. If you feel comfortable doing so, try to talk to the person whose actions have caused you concern as a starting point. You could also get in touch with the Dean, Head of Department/School, Service Unit Manager or your Class Representative. Raise your concern or complaint with one of the contacts below. They will assess the issues raised and support you to work towards an informal resolution as a first step, where possible. The next step is to lodge a formal complaint, in writing, with the UC Grievance Coordinator. The UC Grievance Coordinator will provide advice and coordinate communication between you and the person involved. They will decide who in the University is best suited to investigate and will communicate with you throughout the formal process. The University will inform you of the steps taken to investigate or review the matters that you raised. You will be informed of the decision and how/why it was decided. Any further ways you can appeal will be communicated to you. Visit www.canterbury.ac.nz/concerns for more information about the process, your rights and the support available. If you need to talk someone about anything, there are plenty of people who can help at UC. You got it! From Monday 1 August, the free monthly internet quota for all students will be increased to a whopping 100 GB /month. For some students, that’s over five times their current quota. That means more free online time to help with your studies. The free monthly quota applies to all students currently enrolled at UC and places UC in the top three internet providers from tertiary institutions. Internet usage above your free quota will continue to be charged at 0.02c per MB ($2 per GB). Washington Huskies vs Mainland Eagles – Student Deal! Tickets: $10 student tickets- purchase online here. Limited numbers available at this price so get in quick! UC Sport has secured a fantastic deal on tickets for this exhibition match – UC Student tickets just $10!! Don’t miss out on an opportunity to watch some fantastic international basketball. The University of Washington Huskies are coming to Christchurch to play a Mainland Eagle invitational team made up of some of New Zealand’s best players. 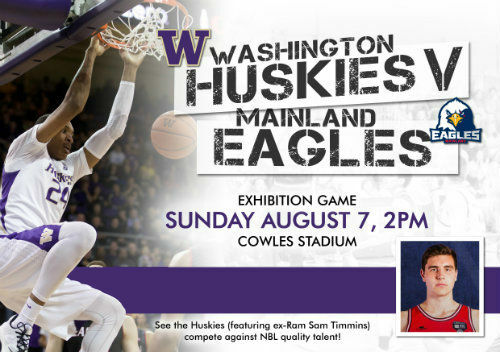 The Huskies team includes ex Rams player Sam Timins and USA U18 Champion Michael Porter Junior (future NBA player)!